It's true. Two cute young ladies were recently spotted by the Crispy Cook scoffing down healthy drinks in upstate New York. And though there was no carbonation, no added sugar or neon food coloring or even a Justin Bieber endorsement involved, they enjoyed their "smoothies" very much! The drinks in question were Dahlicious Lassis, of the Oregon Strawberry and Alphonso Mango varieties, respectively. I received some samples of Dahlicious Lassis from this Vermont-based company that makes these Indian-style yogurt drinks, reminiscent of a really creamy smoothie. According to Dahlicious, the Lassis are made of lowfat milk from grass-fed cows on a small, family farm which is then slow cooked in a process that creates 15 billion probiotic cultures in each bottle and a good bit of natural lactase, which enables many people with lactose intolerance to enjoy a Lassi without ill effect. The lassi base is then mixed with fruit, cane juice and inulin, which gives each drink a healthy dose of fiber (8-9%, depending on flavor). All of this sounded really good to me, as chief nutritionist in the house, but without great taste and appeal, no product is worth spending money on if it languishes in the fridge. Happily, all of the members of our Crispy household (plus one delightful friend) gave this product a thumbs up, both in terms of flavor and creamy consistency. The Maine Blueberry flavor was judged the favorite flavor by our taste testers and I particularly enjoyed the fruity, not too sweet taste. A great product indeed. Locally, you can find Dahlicious Lassis at the Honest Weight Food Coop in Albany or you can order Lassis by the case (12 bottles for $23.88 with free shipping if you live in New England, New York or New Jersey) at the Dahlicious website. You can also enter a monthly giveaway of a free lassi giveaway at the company's Facebook page. 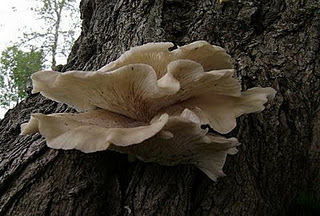 I'll keep an eye out for them in other local food markets and post a comment if I find them for sale elsewhere. I know I'll be buying them for an apres-sports snack for the teenaged soccer star. **Note: I received a package containing five Dahlicious Lassi drinks from the Dahlicious company, but was not under obligation to post a review, favorable or not. As always, my comments about this product were completely my own. As proud as I get when my children do something wonderful , I am as enwreathed in smiles when my creative mom finishes a project. Mom's latest endeavor (and second published book!) is the fictionalized biography of her maternal grandmother, Anna Anisovich Olchick, born in the small village of Pristupovschina, Byelorussa in 1886. Anna emigrated to the United States in 1914, after being banished from her family's home in the wake of a horrible accident, and her courage in leaving all that she knew and loved for an uncertain future in a new land is chronicled lovingly in this book. 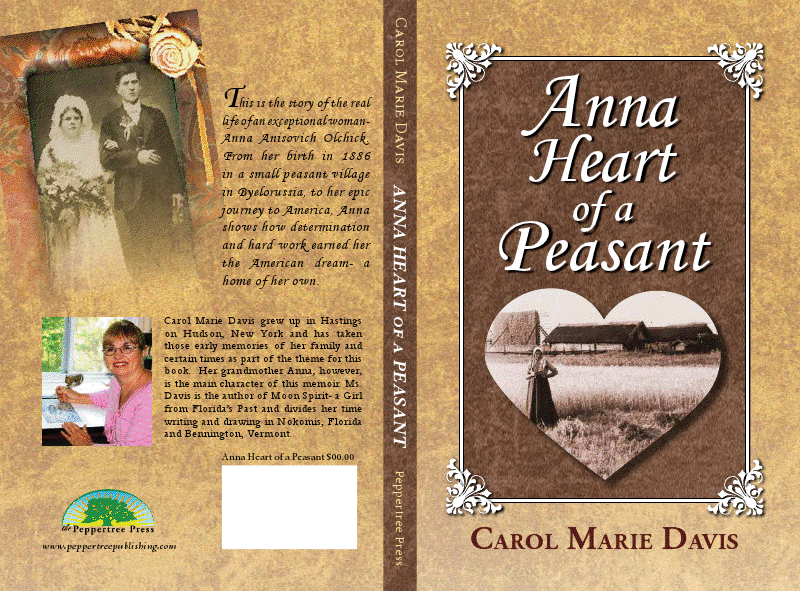 (Anna Heart of a Peasant, by Carol Marie Davis, Sarasota, FL: Peppertree Press, 2011, 108 pages, $12.95). I grew up hearing stories about my great-grandmother Anna (usually called Anita), from her daughter, my grandmother Sophia, and though I'm sure she told me things that were nice about her well-loved mother, I see to have imprinted on the harsh side of Anita. Grandma told me about how her mother used to punish her by making her kneel for hours on dried corn kernels (how medieval!) and how she used to take care of the ever-burgeoning kitten population around the house by drowning the poor babies in a bucket of water in the backyard. Then there was the embarrassment of having a mother who didn't speak English, who would traipse to the butcher store with my teenaged grandmother in tow, making her speak directly to the butcher and order the weirdest things, like pig's tails and ears. She always seemed like a strange and mean ancestor. However, Anna had endured quite a bit of tragedy, and other stories of her zest for life unfold in the pages of this biography, so carefully researched by my mom over the course of several years. Mom unearthed fragments about Anna's life in Byelorussia, her long voyage to America, life with her husband and children in Hastings-on-Hudson, New York, and her talent for gardening, home remedies and cooking. I've filled in many more details about my great-grandmother and after reading my mom's book, I've come to love her, corn kernels and feline atrocities aside. One thing that has made me feel closer to Anna is her love of gardening and cooking. She always had turnips, grapes, herbs, carrots and garlic in her garden and was adept at preserving the harvest by drying, canning, salting or fermenting them into sauerkraut or homemade wine. I love that my mom included eight of Anna's recipes (updated with measurements and enlivened with some delightful illustrations) at the end of the book, so that readers can try out some traditional Russian peasant fare. 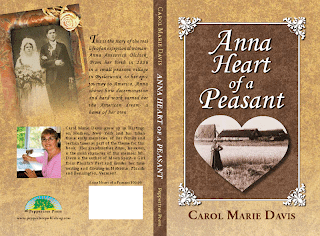 Some blogger friends of mine are going to join me in reviewing Anna: Heart of a Peasant and we are all planning to try out some of Anna's or other Russian recipes. 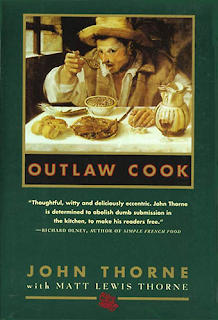 Look for reviews of this book by Deb of Kahakai Kitchen, Heather of Girlichef, Claudia of Honey from Rock, Alicia from Foodycat and Simona of Briciole in the coming weeks, which I will roundup back here at The Crispy Cook next month. I made up a big pot of Cabbage Soup the other day based on Anna's recipe. I tweaked it a bit to include what I had in the pantry, so this is an adaptation of this hearty vegetarian soup. My comments are in the parentheses). Heat oil and sauté garlic in a large soup pot over medium fire until garlic is soft, about 2 minutes. Add onion and sauté until soft as well. Add 3 cups of water, carrots, tomatoes, tomato paste, brown sugar, bay leaf and simmer for 10 minutes until carrots are tender, about 10 minutes. Take out the bay leaf and discard. If I have piqued your interest in this wonderful book, you can borrow a copy from your local library or buy a copy on Amazon or from my mother directly if you would like a signed copy (I'll send you the details if you leave a comment below). It truly is a wonderfully written account of an interesting life and one which I am very grateful has been elaborated for others to learn from and enjoy. Thanks Mom, from the bottom of my own peasant heart. This month's baking project for the Gluten Free Ratio Rally is BISCUITS in all their incarnations. My family are all Northerners, so biscuits don't feature as prominently on our table as they do with Southern diners, but we do enjoy sopping up a good soup or stew with a soft, fluffy biscuit now and again. Dan the Breakfast King makes a mean batch of cottony Buttermilk Biscuits, but I hadn't done much biscuity exploration in the kitchen until this month's GF Ratio Rally host, Gretchen of Kumquat, picked them for our group. I did a little prowling around the 'net and found out that there's an annual Biscuit Festival held in Knoxville, Tennessee, where the bake-off is divided into the categories of Buttermilk Biscuits, Sweet Biscuits, Savory Biscuits and Most Original Biscuits (Fat Elvis Biscuits, anyone?). Savory Biscuits beckoned my further attention, so I took a look at what supplies I had in the baking cabinet and in the pantry and thought I would tweak a standard Baking Powder Biscuit recipe into something savory and maybe even a little sassy. When my bag of chickpea flour (labeled besan since I bought it in an Indian foods market) waltzed into my orbit, I immediately thought of using its rich, beany flavor as part of my flour mix. Then, since chickpeas usually equal hummus in my house, the idea for a hummus flavored biscuit was born. The idea was to incorporate all those heavenly hummus flavors, garlic, cumin (I used toasted cumin seeds, coarsely ground in my coffee mill for a little extra texture, but you could just use ground cumin if that's what you have on hand), parsley, lemon, olive oil, salt and a little hot pepper, because I like a spicy hummus. 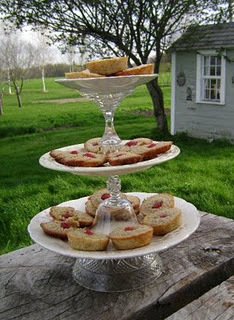 I went to my kitchen cookbook shelf and plucked Marion Cunningham's Fannie Farmer Baking Book down. This was one of my favorite baking cookbooks in my pre-GF days and I've found it to be a good starting point for preparing to convert these very detailed recipes into gluten-free versions. Marion/Fannie's Baking Powder Biscuit recipe (p. 572) proved once again to provide good background information about preparing biscuit dough and I used its' "bones" to work through my recipe. The other starting point that GF Ratio Rally bakers use is a ratio of primary ingredients (measured by weight, not volume) and for the Biscuit Project we started out with 3 parts flour, 2 parts liquid and 1 part fat. My biscuits came out quite nicely: they held their shape, rose a little, and had a nice crumbly texture with a CRISPY outside. I had the idea that fresh chopped parsley and lemon juice would be better in an olive oil dipping sauce, but I think that next time I would mix the parsley and some lemon zest into the biscuit dough instead. These biscuits really smelled tempting while they were baking and we enjoyed them hot from the oven paired with their dipping oil and softened butter for a hearty winter afternoon snack. Scrumptious! The next day they were the perfect sops for a vegetable curry. Scrumptious II! Stir together dry ingredients above until well mixed. Add in shortening with a pastry blender or two butter knives until mixture resembles coarse sand. You really want the fat mixed in well with the flours. Add in milk and mix well until dough clumps together. Turn out on a sheet of plastic wrap and cover and chill in refrigerator for 20-30 minutes to let shortening in dough harden up again. Preheat oven to 425 degrees F. Lightly dust work surface with white rice flour and plop dough down. Working quickly with floured hands, pat dough down into 1/2 inch thickness. Cut into 16 rounds (3 inch diameter) and place on parchment lined cookie sheet. Baked 15 minutes or until they have puffed up and are lightly browned. Serve immediately with Olive Oil Dipping Sauce on the side or split and spread with softened butter. Gretchen will have all the links to the sweet, savory and other interesting gluten-free biscuit variations back at her Kumquat blog, so be sure to check back and visit!